Here is my newest power supply that was designed for the 1929 Hartley transmitter. It is a basic P/S with choke input filtering. The type 27 tube used in the Hartley and the type 80 rectifier were both introduced in 1927. The obvious choice was a power supply using a type 80 rectifier. The 80 is a full wave rectifier requiring 5 volts @ 2 amps for the filament. I chose a balloon shaped ux-280 over the more common shoulder type 80. I decided to be a little more creative and to deviate from the conventional flat chassis design. I had an old DeVry multimeter in the junk box that had a nice steel cabinet with a crinkle finish. It measured 4.5 inches deep by 5.5 inches wide and 8.0 inches tall. The back of the meter became the front of the P/S with a screen in back for safety and ventilation. Use caution when using or building tube power supplies as voltages can be LETHAL and if unsure of anything, seek help as needed. Luckily I was able to purchase a NOS Utah transformer with the correct voltage and a NOS Allied Knight choke rated @ 10 henries and 90 ma. A super deal at 10 USD a piece. The binding post and other small parts came from the junk box. I had to mount the transformer upside down to keep the lead lengths from being too excessive. The bracket was fabricated from aluminum. With careful planning I was able to fit everything inside beautifully. The P/S provides 2.5 VAC for the filament and 308 VDC for B voltage. The key down voltage with the Hartley is 248 VDC. With the Hartley set at 40 ma. this provides about 4 watts output. The maximum plate voltage for the type 27 tube is 180 volts. They seem to operate at 250 volts with no problems. 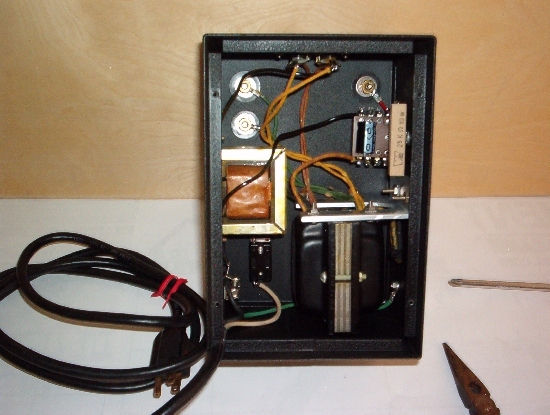 This power supply was another fun project with satisfying results. The unconventional look is an added bonus. These Web Pages were created by using 100% Recycled Electrons. 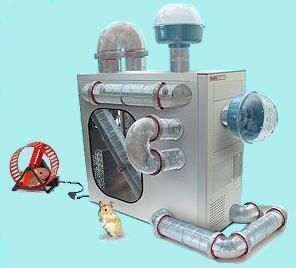 With a little help from my furry friends and a Hamster Powered PC.